This is the first in a series of posts on home court advantage in the NBA. Each post will examine home court advantage from a specific statistical angle. Home court (and home field) advantage may be one of the most documented and replicated phenomena in the field of psychology. It shows up in every major sporting competition: soccer, football (professional and collegiate), baseball, college basketball, and the NBA. There is a wealth of statistics supporting its existence, literally spanning three centuries. Since 2010, home teams in the NBA have won 59% of their games, with an average point differential of 2.8 points. While home court advantage has been on the decline, relative to the veritable coach and buggy days of the 1970's (see this chart from ESPN's Tom Haberstroh), rumors of its eventual demise may have been exaggerated. At this point in the season last year, home teams had an all-time low winning percentage of just 53.7%. It appeared we were in the midst of a home court advantage sea change. NBA teams were finally winning the road battle, thanks to advanced biometrics, disinterested crowds, and sweet, sweet chartered jets. Or so it seemed. As it turns out, that low point was nothing more than a statistical head-fake. Home teams went on to win 62.1% of their games for the remainder of that season, bringing the overall total to 57.5%, just a point or two below the recent average. 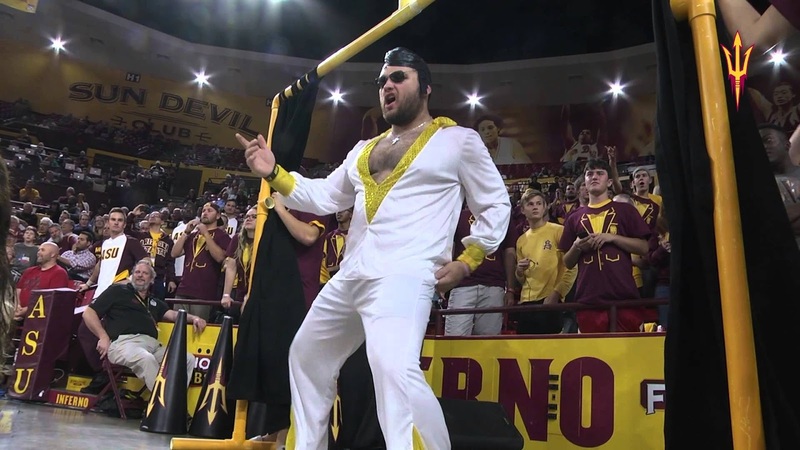 For the 2015-16 season, home teams have a 59.0% win percentage thus far. Home court advantage stubbornly persists in the NBA. So what causes it? I don't pretend to have the answers now, but in this post, and in the ones that follow, I intend to examine the various ways home court advantage manifests itself in the NBA. We'll focus first on data collection, and theorize along the way (beware those who skip that first step). Let's start with an easy one to measure: free throw shooting. The chart below shows free throw percentage, split by home and away teams, for the past twenty seasons. 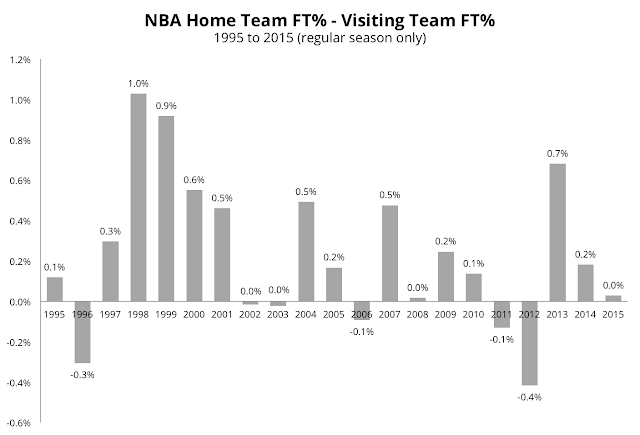 It's noisy, but there is a slight bias to better FT% for home teams. The effect shows up more clearly if we just chart the difference. Over the past twenty years, home teams have shot 75.2% from the stripe, compared to 75.0% for away teams; not exactly an overwhelming advantage. Teams average approximately 25 free throw attempts per game. An 0.2% improvement amounts to just an 0.05 net points advantage. Over the past 10 seasons, the advantage is even slighter: 75.6% for home teams and 75.5% for away teams. So, whatever causes home court advantage doesn't appear to significantly affect a player's ability to shoot free throws. This is somewhat consistent with an earlier study of mine, which showed that free throw shooting did not suffer in high pressure situations (although field goal shooting did). Whatever psychological "stress" players may be under, either due to playing on the road or facing clutch situations, it doesn't appear to affect foul shooting in a significant way. Visiting teams are behind more often, so will commit more deliberate fouls late in the game. They will try to foul home players who are worse foul shooters. Therefore, the pool of home foul shooters is worse than the pool of road foul shooters, which is why it looks like there's no home field advantage in foul shooting. While plausible, one could make the opposite argument. In late game situations, while trailing teams want to foul the poor shooters, the team with the lead will often put their best shooters on the floor and/or make sure to keep the ball out of the hands of a poor shooter. So, what does the data say? I have detailed player stats going back to the 2009-10 NBA season. For each season, we will calculate the player's overall FT% (home and away), and then weight that percentage by both home and away attempts. If Birnbaum's theory is correct, the home-weighted percentage should be lower than the away-weighted percentage. We can then quantify that impact to arrive at a more accurate estimate of the player-specific effect of home court on free throw shooting. It appears that Phil's theory was correct, although the effect is small. The average free throw percentage for home attempts slightly oversamples poor free throw shooters. This makes the gap between home and away free throw rates look worse by approximately 0.1%. Over this same time period (since 2009-10), the raw home and away free throw percentages are 75.7% and 75.5%, respectively, making for a gap of 0.2%. Correcting for the bias we just identified, the "true" home vs. away gap is 0.3%. 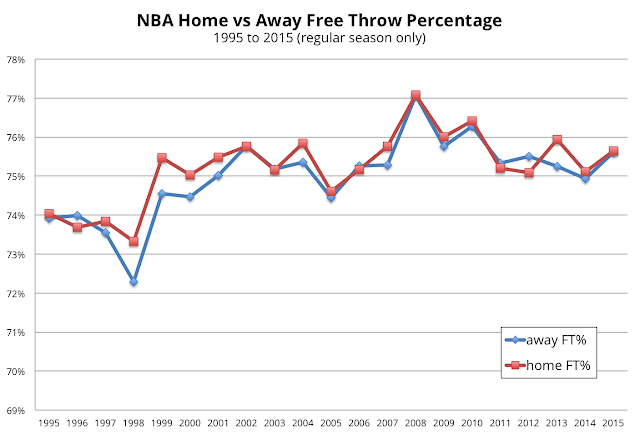 Home court advantage affects free throw accuracy, but its impact is very small. Home free throw percentages are about 0.2% higher than they are on the road. An 0.2% better free throw rate is worth an improvement of 0.05 net points. However, this result is biased by the fact that home free throw attempts are more likely to be taken by poor free throw shooters. After controlling for this bias, the home court advantage for free throws is 0.3%. In other words, for an average player, one would expect an 0.3% better free throw percentage at home, compared to on the road.